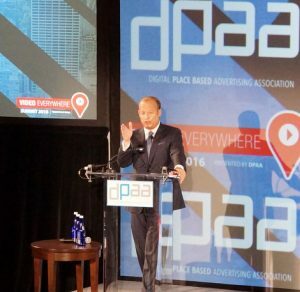 The Digital Place Based Advertising Association (DPAA) has lined up a mighty impressive bunch of speakers for its annual Video Everywhere Summit  in New York on November 1, 2017. Sharing the stage at the all-day event – a big part of New York Digital Signage Week  (October 30-November 3) of course will be thought leaders from leading brands and agencies, along with prominent journalists and authors. The historic Roosevelt Hotel, known as ‘The Grand Dame of Madison Avenue’ is the official hotel of New York Digital Signage Week. Attendees to the Video Everywhere Summit or any other of the week’s events are eligible for preferred hotel rates. These rates and all Summit information can be accessed here .